READY TO LEAVE NOW BUT WILL KEEP OVER XMAS IS NEEDED. CAN COLLECT ON XMAS EVE OR XMAS DAY. BROUGHT UP IN A FAMILY HOME !! 6pups looking for forever homes. 24/7 aftercare support for as long as you require. The pups are being brought up in a family home meaning they are getting exposed to all the sights, noises, smells and stimulation they need to ensure they they become stable and happy family pets. They are receiving the up most care and being fed a quality diet. Pups are ready to leave now. I am happy to keep them over the xmas period and also available for collections XMAS EVE AND DAY. Pups are from quality pedigrees and both parents are very fit and healthy with Great structure, nice wide nostrils and good breathing. Mum has self whelped a litter. Pups have Superb bone, awesome heads with exceptional unsweep of the jaw, deep brisket with nice sprung ribs, conforming to the correct tail, great quality. 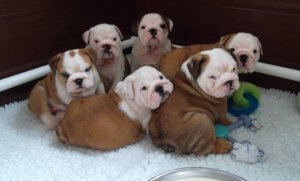 Pups have a Inbreeding Coefficient of 8% well under the average for the breed which is 9.9%. (The inbreeding coefficient is a measure to protect both the progeny from a litter and also for the overall breed. Just as important are considerations to temperament, breed type and characteristics.